The Profit Impact of Business Intelligence presents an A-to-Z approach for getting the most business intelligence (BI) from a company's data assets or data warehouse. BI is not just a technology or methodology, it is a powerful new management approach that – when done right – can deliver knowledge, efficiency, better decisions, and profit to almost any organization that uses it. When BI first came on the scene, it promised a lot but often failed to deliver. The missing element was the business-centric focus explained in this book. It shows how you can achieve the promise of BI by connecting it to your organization’s strategic goals, culture, and strengths while correcting your BI weaknesses. It provides a practical, process-oriented guide to achieve the full promise of BI; shows how world-class companies used BI to become leaders in their industries; helps senior business and IT executives understand the strategic impact of BI and how they can ensure a strong payoff from their BI investments; and identifies the most common mistakes organizations make in implementing BI. The book also includes a helpful glossary of BI terms; a BI readiness assessment for your organization; and Web links and extensive references for more information. BI is the key benefit of strategic use of a company's data warehouse. As such, some of the same people that work in data warehouse and data mining are the audience for this book. So, the book's target audience includes both technical and non-technical professionals and decision makers in organizations that are considering business intelligence or who are intent on improving their existing business intelligence capability. This includes IT management, IT data architects, data warehouse professionals, database designers, business intelligence consultants, and technical professionals. We expect that there will be some handoff of book information to non-technical management as an argument for investing in BI. Steve Williams is the founder and CEO of DecisionPath Consulting. He specializes in helping clients formulate business-driven, technically-savvy strategies for leveraging business intelligence, analytics, and big data to improve profits. Steve blends general management experience and a general management MBA with nearly 30 years’ experience in the information systems field - the last fifteen of which have been spent in the business intelligence (BI) and analytics specialty. While the industries and companies are different, there are many common challenges when it comes to leveraging BI, analytics, and big data to enhance profitability. Steve understands these challenges, and he provides proven methods for meeting them. In addition to his consulting work, Steve is also an active contributor to the field of business intelligence, analytics, and big data. 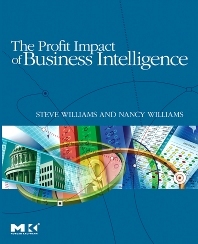 He and Nancy Williams wrote The Profit Impact of Business Intelligence in 2006, and Steve has continued to write for magazines such as Strategic Finance, Business Intelligence Journal, and MWorld (The Journal of the American Management Association). In addition to widely-sharing his thinking about BI, analytics, and big data, Steve has also served as a judge since 2001 for the annual TDWI Best Practices in Business Intelligence and Data Warehousing Competition. Prior to founding DecisionPath, Steve worked for twenty years in several specialized consulting companies where he developed expertise in program management, systems integration, software engineering, and management accounting. He holds an MBA in General Management from the Darden School at the University of Virginia and a B.S. in Business Management from the University of Maryland. Nancy Williams is Vice President of DecisionPath Consulting. With over 21 years of business and technical experience, she provides technical and strategic leadership on business intelligence as well as hands-on guidance for client engagements.